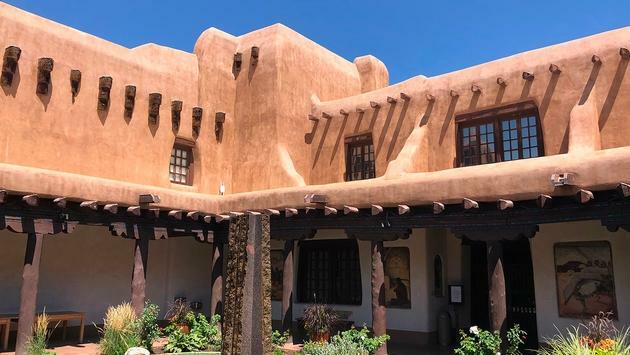 Santa Fe has long been known as a regional as well as international art escape, thanks to its bevy of art galleries and creative institutions. But in addition to shopping for that next piece of art for your bedroom wall, a recent trip highlighted three amazing—and very different—art experiences that the city has to offer. When I first heard about Meow Wolf, at a dinner in Scottsdale a couple of months ago, the people who had been had a hard time describing it. They just implored me, “You HAVE to go.” After going myself, I struggle myself to describe it to people. 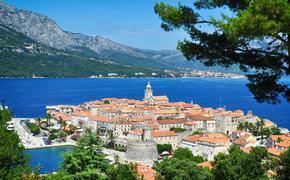 Built in a former bowling alley on the outskirts of town and funded in part by Game of Thrones author George R.R. Martin, this arts and entertainment group is also developing future outposts in Denver and Las Vegas. The immersive experience is a weird mashup of a haunted house, TV shows like Stranger Things and the X-Files, and a psychedelic art museum. You wander through fantastical spaces—weird alternative (or parallel) universes that have intersected with and altered a seemingly normal home. Figuring out what happened to the occupants of the house is your goal, but don’t expect to figure out the whole story in one visit. We enjoyed the experience, but our kids absolutely loved it. 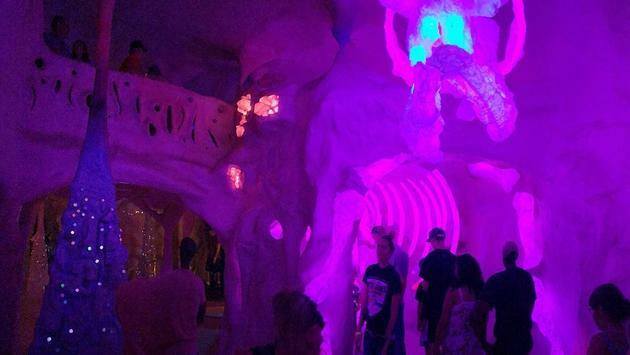 Meow Wolf (which was supposedly named by picking two words out of a hat) occasionally has long lines to enter, so plan your visit accordingly. Our only complaint was the volume of people when we were there. We overheard other people saying how much more enjoyable it had been on their last visit, when it wasn’t so crowded. We opted to do this one without the kids, who were begging for some downtime. The museum is a wonderful exploration of O’Keeffe’s life, from her early days in New York City to her later years at the Ghost Ranch in northern New Mexico. Many of the artists’ amazing paintings, many of which focused on landscapes, cityscapes, weathered animal bones, and flowers, are on display here in simple galleries. I particularly enjoyed a film about O’Keeffe, which made clear both her humor and dismissal of the patriarchal attitudes of her time. Those who want even more background on the artist can visit O’Keeffe’s Home and Studio in Abiquiú, about an hour drive north. Located about a block from the city’s iconic central plaza, this museum has an impressive collection of pieces that celebrate New Mexican art and the state’s influence on art across the globe. I also quite impressed with the museum’s variety of workspaces geared specifically to children. They were encouraged to draw, write and explore. One area included a functioning typewriter, and my kids were fascinated to play with the instrument, something that seemed so pedestrian to me a couple of decades ago. We particularly enjoyed the latter exhibition, as well as the museum’s lovely collections of New Deal artwork and painting of Santa Fe.